Linselles is a town in the departement Nord, 25 kilometres north of Lille. Leaving the church on the Rue Freres Vanrullen in Linselles, turn right at the first junction. Take the next turning on the left opposite the garage. Linselles Communal Cemetery is 200 metres from this turning on the right hand side. The Commonwealth War Graves plot is situated towards the centre of the cemetery. The Communal Cemetery was used by the Germans in the 1914-18 War; but after the Armistice the 681 German graves were removed. 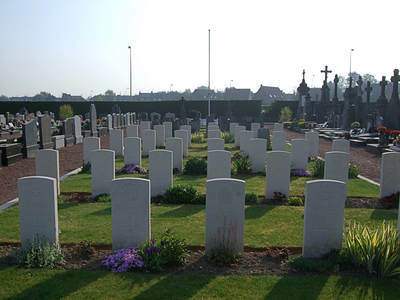 The British graves were regrouped in the South-East part of the cemetery. There are now over 30, 1914-18 and a small number of 1939-45 war casualties commemorated in this site.